The building that would become known as the Old Corner Bookstore began as an apothecary shop. It was built by Dr. Thomas Crease after the Great Fire of 1711 on property that once belonged to the Puritan dissident Anne Hutchinson. 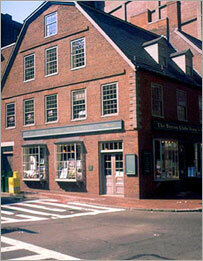 In 1828 a bookstore and printing shop was opened, and flourished through 1903 under various proprietors. It peaked under the management of publisher Ticknor and Fields which became the nation’s leading publisher between 1833 and 1864. They produced the works of Henry Wadsworth Longfellow, Harriet Beecher Stowe, Nathaniel Hawthorne, Ralph Waldo Emerson, John Greenleaf Whittier, Oliver Wendell Holmes Sr., Charles Dickens and Louisa May Alcott, many of whom were frequent visitors to the building. During the bookstore’s heyday the corner of School and Washington came to be known as Parnassus Corner, a reference to the mountain home of the Twelve Muses of Greek mythology. The building was restored in 1960. 식민지 건축의 한 예로 보여지는 건축물로 지금은 '글로브 코너 북 스토어'라는 이름으로 보스턴 글로브사의 서비스 숍으로 쓰이고 있습니다. 1712년에 지어진 붉은 벽돌건물로 농가의 헛간처럼 보이기도 하는데 주위에 빌딩들이 둘러 싸고있어서 위화감이 느껴집니다. 19세기 에머슨과 롱펠로, 호손 등 뉴잉글랜드의 문학가들이 모이는 장소로 사용되어 보스턴 문학의 중심지로 알려진 장소이기도 하며 1960년에 한번 개축공사를 한뒤로 현재는 보스턴과 뉴잉글랜드의 역사서, 여행서적과 글로브사의 로고가 들어간 티셔츠와 머그컵 등 주로 판매하고 있습니다. 위치 : 3 School & Washington St.